Seedy Saturday is a catchphrase used for seed swap events that bring the public together with seed savers, to maintain and develop the open pollinated and heritage crop cultivars that are a resource in a community. 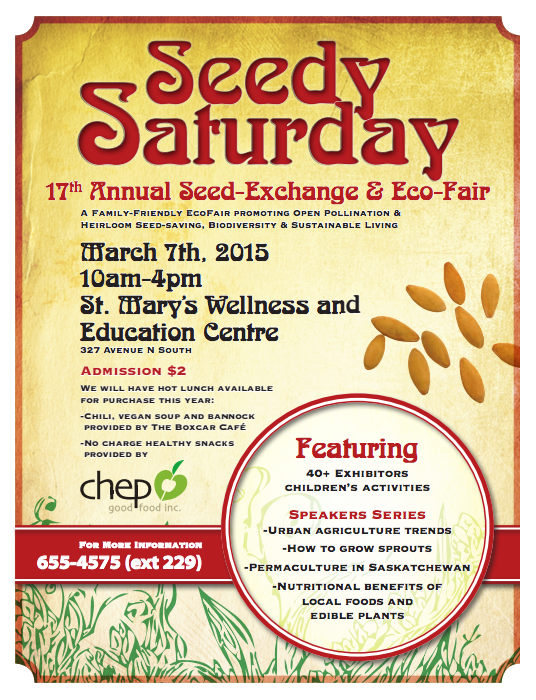 CISV Saskatoon Members are signed up for “Set Up” of the event from 8AM-10AM following Set Up the CISVers will be invited to join a short activity about Seedy Saturday/CHEP and why it’s important in our community. Following our activity you will be invited to attend the ECO fair and demonstrations at no charge. To volunteer please send us an e-mail cisvsasaktoon@gmail.com or call one of our organizers below to let them know you are oming. Come to St. Mary’s Wellness Centre and entre at the North Door at 8AM, ask for Gord Androsoff when you arrive.